►Vehicles with smart key system The following gauges, meters and display illuminate when the “ENGINE START STOP” switch is in IGNITION ON mode. 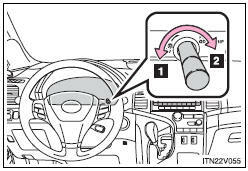 ►Vehicles without smart key system The following gauges, meters and displays illuminate when the engine switch is in the “ON” position. Displays the engine speed in revolutions per minute. Displays the quantity of fuel remaining in the tank. 4. Engine coolant temperature gauge Displays the engine coolant temperature. 5. Odometer/trip meter and trip meter reset button Switches between odometer and trip meter displays. Pushing and holding the button will reset the trip meter when the trip meter is being displayed. 6. Odometer and trip meter Odometer: Displays the total distance the vehicle has been driven. Trip meter: Displays the distance the vehicle has been driven since the meter was last reset. Trip meters A and B can be used to record and display different distances independently. • Do not let the indicator needle of the tachometer enter the red zone, which indicates the maximum engine speed. • The engine may be overheating if the engine coolant temperature gauge is in the red zone (“H”). In this case, immediately stop the vehicle in a safe place, and check the engine after it has cooled completely.